Juggling the varying availability of a part-time staff makes employee scheduling one of the hardest things a restaurant manager does! Point of Success Employee Scheduling works with staff information already entered in your Point of Success Office Manager software. Begin using the program by setting up the times each day when staffing is needed at every position in the restaurant. Each day of the week can be defined differently. If Friday is a busy night for delivery, add additional staff for those hours. If the restaurant is open fewer hours on Sunday, then reduce the time allotted for each position. Each position in the restaurant is set up at the top of the window. Staff members already entered in Point of Success display at the bottom of the window. Clicking a time slot will flag employee eligibility on the bottom of the window. In this example, the employee shaded in light red is unavailable for the shift. The employees flagged with the light green color are available for the selected shift. 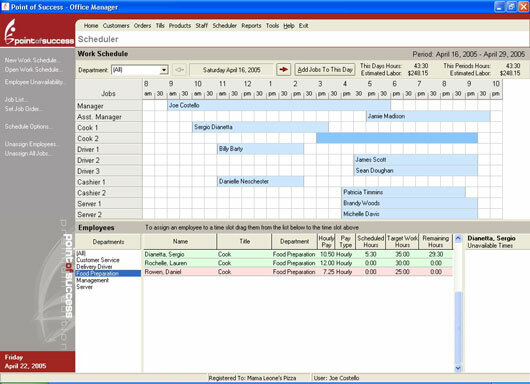 Click an employee, then drag and drop the employee onto the schedule bar to schedule the employee for a shift. Can You Work on Wednesday? 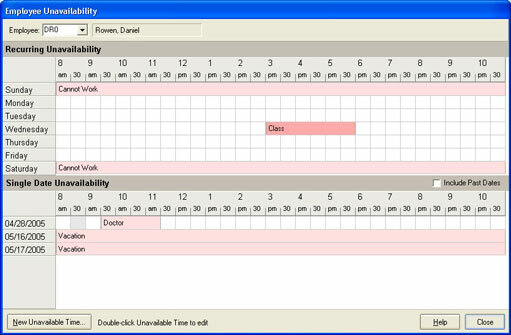 Employee availability tracking is central to scheduling. Point of Success Employee Scheduling tracks when employees are unavailable for work on repeating and one-time schedules. Define the times each employee is unavailable for work. The unavailable times can be repeating, as with a student’s class schedule, or the unavailable times can be for one event, like an appointment with a doctor. Previous schedules can be copied for use in new schedules. Copied schedules can include jobs, times and employees, or only jobs and times. Point of Success Employee Scheduling includes over a dozen reports. Use this information for communicating schedule information to employees, analyzing predicted labor cost, and more.